The alarming decline in bee population could cause bees to become extinct in the very near future. Honey bees, which account for more than $15 billion through their vital role in keeping fruits, nut and vegetables in our diets have fallen prey to a mysterious disorder called ‘Colony Collapse Disorder (CCD). This is a syndrome defined as a dead colony with one live queen and immature bees unable to sustain the hive.To date, no scientific research has been able to uncover the root cause of CCD. With such a dire natural disaster at stake, might the Leader of the Free World be able to turn this situation around. Such is the task that President Barack Obama has taken on. It’s his hope that his administration will be able to save the bees by finding more habitats for them to feed and pollinate. The new federal plan spearheaded by the U.S. Department of Agriculture is actually looking to reverse America’s declining bee population by making millions of acres of federal land more bee-friendly. While planting new bee-friendly environs at federal offices across the country might sound like too little too late, several bee scientists see this as a major move in the right direction. "Mitigating the effects of pesticides on bees is a priority for the Federal government," the report stated. The report als call for an increase in healthy habitats for the pollinators -- with the directive for Federal buildings across the country to construct new pollinator gardens and the restoration of 7 million acres of federally managed lands in a more pollinator-friendly way. 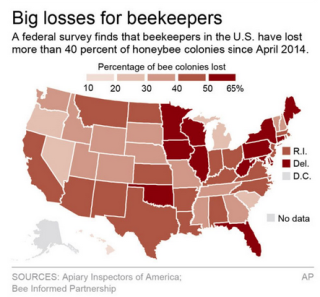 Bees need Bipartisan Support . . .
What hopefully won’t become a political hot-potato and stumbling block between parties, the sticky point is the amount of funds, which will be necessary to achieve all of the task forces’ recommendations. 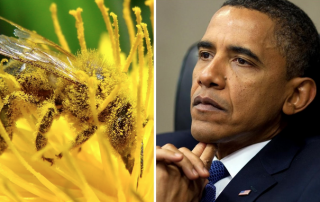 By example, Obama preempted his ’Save the Bees’ initiative four years ago by seeking out a czar of sorts to create the first ever beehive on White House grounds. Charlie Brandt, a White House carpenter for more than two decades, started beekeeping as a hobby, and the Obama White House quickly embraced the idea of making honey on-site to use in White House recipes. Brandt is now the official beekeeper of the first ever beehive to take residence on White House grounds. The beehive is located on the South Lawn, and the foraging bees help pollinate the Kitchen Garden. Take a look at this year's colony, estimated at about 70,000 bees, and listen to how the idea for a beehive on the South Lawn came about.